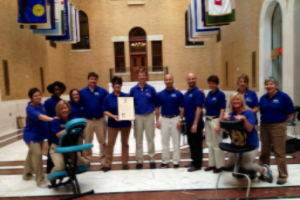 The AMTA Massachusetts Chapter is always looking to spread awareness about massage therapy. Sometimes we reach out to potential clients. Sometimes we focus on health care providers who can provide referrals. But this October 24, chapter volunteers spent their time sharing their passion for massage with another kind of individual who can have a huge effect on the massage therapy community here in our state: our legislators. Over 180 individuals from more than 70 offices experienced firsthand the benefits of receiving massage from a trained and licensed therapist. This piqued quite a bit of interest (how often does one see massage chairs set up in the Great Hall of Flags? ), and opened the doors for conversations about HB 2030/HB 185, a bill that clarifies several matters of scope of practice for Massachusetts MTs, and additionally aims to close a loophole that exists in the laws about unlicensed massage. A bit more about that: currently unlicensed massage therapists in the state of Massachusetts are not permitted to advertise their services via newspapers, magazines, or television, but this law does not explicitly mention the internet. HB 2030/HB 185 (one bill with two different names) would amend the law to prohibit online advertising as well, cutting down on those engaged in illicit activity who attempt to masquerade as a massage business. If passed, the bill would also help law enforcement shut down human trafficking rings, which are known to use this loophole to their advantage. The AMTA Massachusetts Chapter is dedicated to inspiring, educating, empowering, and advocating for the massage therapy community. Our legislators on Beacon Hill and their staff members are similarly committed to serving the people of Massachusetts. When we work together, we can accomplish great things for the massage therapists of our state, whether it’s proclaiming a statewide Massage Therapy Awareness Week or helping our laws advance along with the profession. And this means that we, in turn, can help even more of our fellow citizens with the many benefits of massage. Matthew Old, Feiz Farzin, Tonya Taylor, Jeffrey Smay, Jennifer Olstein, Debbie Baker, Noreen Chase (not pictured),Cynthia Sykes, Regine Ryder, Farris Ajalat, Laura Lawson, Krystal Robillard, Marie Owens, Sharon Sharpe, Alex Furth, Mary White, Lisa Parenteau, Richard Wedegartner, Gail Dobinski, Deb Nyuges.